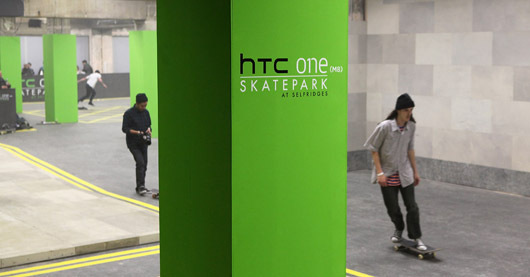 A big night out launching the HTC One Skatepark at Selfridges: let the Boardgames commence! If you’re in London then you can’t have missed the fact that Selfridges is all about the board sports inspiration right now. That’ll be why we found ourselves in the Old Selfridges Hotel car park – deep beneath the streets of London – launching the whole shebang last night. And following fast on the pretty awesome HTC One (m8) launch, it’s all part of a full-on week in H&G. Anyway, we won’t trouble you overmuch with the ins and outs, but suffice to say that the team has pulled out some stunning coverage (with some crackers in the pipeline and about to hit the page). Stand-out pieces came from Vogue, UJ, Dazed and HypeBeast, while The Guardian, Evening Standard and ITV all saw fit to cover the launch. Then there were some stunners across the blogs – consumer tech and street sports – with Digital Spy, CNet, GadgetsBoy, Pursuitist and MPora just some of the crackers the team has landed.